Marinate chicken pieces with chilli powder, pepper powder, garam masala, yoghurt, coriander powder and salt and keep it aside for 30 minutes. Grind grated coconut with cashew nuts, coriander leaves and poppy seeds adding little water to a smooth paste. Heat oil in a pan, add sliced onions and saute till transparent. Add ginger- garlic paste and saute well. Add marinated chicken along with its masala, cover and cook in low flame till done. Was wondering whether I can make veg kurma with the same recipe....chicken looks yum. I always use the instant kurma masala, so your delicious recipe is certainly bookmarked for cooking from scratch! 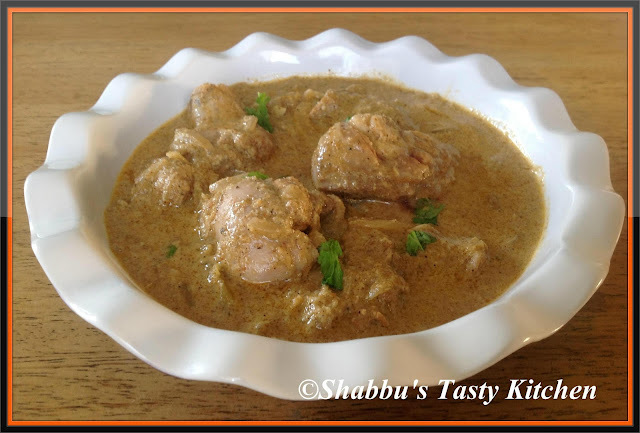 Nice post.. must be yumm..
Yummy looking gravy...love to have with ghee rice. Chicken kurma looks teasingly yum Shabna :) Love it with crispy dosas mmm you made me hungry!! Shabna, it looks absolutely delicious. Very yumm & creamy..perfect with appams!! Thanks for givivng Chicken Kurma recipe is a delicious and wonderful taste. Different Vegetable Kurma recipe is a more health benefits and easy to make at home.